Our Believe Awareness Ribbon Heart Keepsake shows your support for finding the cure. Proudly display this beautifully Engraved Awareness Heart Keepsake at home or at the office. Our Personalized Heart Keepsakes make great personalized gifts for all of your family & friends. 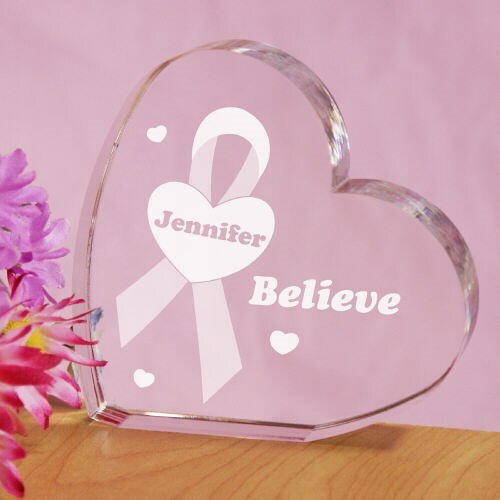 Our Engraved Believe Awareness Heart Keepsake is available on our crystal clear, heart shaped keepsake. Each Personalized Heart Keepsake measures 3 3/4" h x 4 1/8" w. Includes FREE Personalization. Personalized your Believe Awareness Heart Keepsake with any name. This was a very nice item! MyWalkGear.com has many additional Personalized Awareness Gifts for your special gift giving needs. Be sure to take a look at our Strength, Hope, Love, Courage Keepsake and our Awareness Ribbon Ornament as well.